Fishermen could not believe the amount and sizes of the fish when it was time for opening the fishing sites at Kigamboni recently. This followed a trial closure of six months. 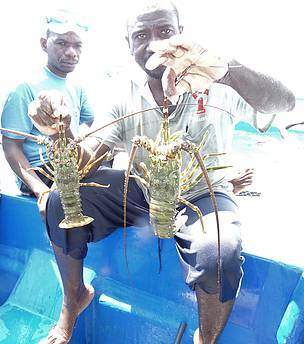 For the first time in seven years a catch of tilapia and lobster has increased from one kilogramme to seven kilogrammes per day. The Fisheries co-management programme by the World Wildlife Fund (WWF) in collaboration with Muongozo Beach Management Unit supported the closure of the fishing site from April this year. During the closure period, stiff patrol operations were conducted by community members to ensure no one goes against their agreement. Intruders were apprehended several times during the closure but finally it was time to reap the fruits of their patience. According to Jummane Mohamed the programme coordinator for Kigamboni and Kibiti the closing of the fishing sites has been carried out for the past five years and the result s have always been over whelming showing massive increase in octopus and other species. “The programme has led to a sharp decrease in blast fishing whereby we used to hear blasts at- least ten times a day but now we can reach up to a year without a sound of a blast, the amount of Lobster catch today is a sign that before the closure the lobsters were caught before reaching their reproductive prime which led to their scarcity,” he said. Mussa Fundi, the chairman for Muongozo BMU said they are working hard to communicate the benefits of giving the fish time to grow and multiply. “We want to reach a point where fishing will be beneficial to fishermen, this is the way to go, for example a fully grown up Lobster of above 500grams costs about 80,000/- to 100,000/- and this is what we call commercial fishing,” he said.